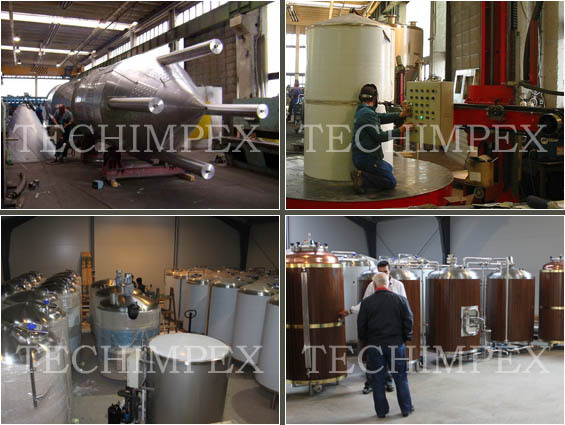 The main activity of company Techimpex s.r.o is the production of brewery equipment. The company produces the following brewing equipment: breweries, minibreweries and microbreweries with capacities ranging from 200 to 50.000 litres of finished beer per day, for special order also with higher productivity. Breweries with high productivity are used for beer production in industrial business, minibreweries and microbreweries (breweries with lower productivity) are mostly placed in restaurants and bars. Microbreweries are usually placed directly in a hall of a restaurant, bar or pub, harmoniously complements the design and produces a nice impression on the visitors and approves them that the beer is always fresh and always alive. The exterior design of the minibreweries can be provided as a natural mordanted wood, polished brass, or classic - stainless steel. Breweries, which we supply, include the full set of equipment and customer does not have to buy something more, because we produce and deliver breweries on a turnkey basis. Our brewing equipment is provided to brew beer by the classical brewing technology and only by using the classical, natural raw materials (malt, hops, yeast and water). For the production of the brewing equipment the company Techimpex uses high quality German and Italian stainless steel. We use all parts of the brewing equipment (electric motors, pumps, temperature sensors, etc.) only of Europe production. Our rule is: a reasonable price along with using high quality materials, high quality work, excellent warranty and post-warranty service. The company Techimpex produces the breweries under its own brand BLONDERBEER.